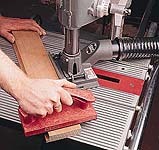 Shopsmith Biscuit Joiner is the better way to join boards. Rating: 5 out of 5 I use biscuits when I don't want pocket screws to be seen. This item works great. Works really nice if you want to biscuits side by side on a thick piece of wood. Bought it onsake and would buy it again. Rating: 5 out of 5 Sadly, I purchased a used one because of my pocket book. This is a great tool and I normally set up in drill press mode. I use the rings on the guide posts to determine my depths for the size biscuit I desire. I can do ends, anywhere along the side of a board. The non-slip is great to have and the small pins that help to hold the board in place is wonderful touch. I hope I can have the blade sharpened (carbide) as I use it as often as I can. Great tool!